Obstructive sleep apnoea syndrome (OSAS) is currently the most common clinical disease of sleep-disordered breathing, which is characterized mainly by sleep deprivation, hypoxemia, hypercapnia, and pH disorder . In addition to causing sleep disorder and increasing the incidence of hypertension and cardiovascular and cerebrovascular diseases, the disease significantly affects the cognitive function of patients, which is mainly characterized by an overall cognitive decline, including functional impairments in aspects of attention, memory, orientation, calculation, and execution . Cognitive impairment is associated with cell apoptosis and synaptic plasticity. In the nervous system, hippocampal tissues are mainly responsible for learning and memory, and they may also facilitate long-term learning and memory as well as acousto-optic and taste-related events . A substantial number of studies have reported that OSAS may lead to inattention, decreased efficiency at work, a decline in executive ability and other cognitive impairments in patients; and many experiments have shown that OSAS rats also exhibit pathological damage to their hippocampus [4,5]. However, the pathogenesis of cognitive impairment caused by OSAS remains unclear, which is one of the causes of dissatisfactory clinical curative effects. Therefore, the determination of the cognitive functions of OSAS rats and an in-depth investigation of the expression of related proteins in hippocampal tissues will contribute to the provision of novel ideas for clinical diagnosis and treatment. Currently, the mechanism of OSAS has been widely studied because CIH animal models can better simulate the pathogenesis of OSAS . It has been reported that the cognitive impairment caused by OSAS may be related to hypoxia, sleep fragmentation, neurotransmitters, inflammatory mediators, and changes in related brain areas, which may cause the loss of synapses, thus impairing cognitive function [7,8]. Whether information transmission, processing and neuronal storage can proceed smoothly depends on whether the structure and function of synapses are intact. Synaptic plasticity is the ability to change synaptic structure and function to adapt to environmental changes and information storage. It plays a vital role in the development of the nervous system learning and memory. Changes in synaptic plasticity may cause changes in synaptic structure, altering not only the number and size of synapses but also the number of presynaptic vesicles . Synaptophysin (SYP) is a type of calcium binding glycoprotein widely distributed in the vesicular membrane of the nerve presynaptic membrane. SYP weighs 38 kDa, releases Ca2+-dependent neurotransmitters and is involved in the introduction and recirculation of synaptic vesicles and in the induction and dimension of long-term potentiation (LTP). It is regarded as a specific marker protein of presynaptic terminals. Its expression accurately reflects the synaptic density, distribution area and functional state and thus reflects plasticity . Studies have indicated that OSAS synapses experience structural and functional changes, and some scholars believe that the cognitive impairment associated with OSAS is a cause of Alzheimer's disease . Decreases in learning and memory abilities in neonatal rats after ischaemia and hypoxia are related to ultrastructural changes in hippocampal neurons and the number and density of synapses . Wu et al. indicated that hypoxic and ischaemic neonatal rats exhibit chronic learning and memory impairment, and the progressive decreases in hippocampal neurons and SYP expression comprise one potential mechanism. However, the protein expression of SYP has not been clearly elucidated in the course of OSAS-induced cognitive dysfunction. GAP-43 (growth-associated binding protein 43) is a growth-cone-rich neural tissue-specific phosphoprotein that is closely related to synaptic plasticity, axonal regeneration, and neural development . It is composed of 226 amino acids and is a highly hydrophilic protein that is easily phosphorylated by PKC. Phosphorylated GAP-43 is involved in the regulation of growth and plasticity by regulating cytoskeletal components . In the rat central nervous system, GAP-43 expression peaks in the rat hippocampus and neocortex two weeks after birth, which is consistent with synapse formation and GAP-43 mRNA and protein expression in most brain regions. The level of expression is significantly reduced. A large amount of expression has been observed in the marginal zone and the junctional zone, indicating that plasticity associated with long-term memory was identified . Overexpression of GAP-43 and PKC genes significantly enhanced the long-term enhancement and learning ability of transgenic mice, which was associated with LTP and memory, suggesting that GAP-43 is involved in the regulation of learning and memory. Studies have shown that in the early stage of the nervous system development, GAP-43 content is increased in the neuronal cytoplasm. As the brain develops, GAP-43 expression gradually decreases; however, when brain injury occurs, its expression increases and gradually decreases with increasing time of injury repair and gradually decreases in the injured area . Therefore, GAP-43 is regarded as an important marker for investigating nerve growth, development and repair. Kawasaki et al. have reported that the expression of GAP-43 in rat hippocampal neurons and the cerebral cortex is increased after hypoxia, which suggests that after hypoxia injury, the nervous system initiates a self-protection mechanism and repairs damaged neurons. Continually increasing GAP-43 expression is one approach to repair nerve damage. A previous study  indicated that the expression of GAP-43 in the hippocampus of an ischaemia reperfusion group began to increase at 24 hours after reperfusion and peaked at day 7. The difference between the day 14 and sham operation groups was statistically significant, which indicates that the increase in GAP-43 expression may be related to synaptic remodelling and regeneration of neurons, which comprises the endogenous compensatory mechanism of neurons after cerebral ischaemia. Researchers have reported that hippocampal neurons in rats of the epileptic model rats with acute, intermittent and chronic recurrent brain injuries have high expression levels of GAP-43. These findings suggest that increased GAP-43 expression in the central nervous system may be involved in the mechanism underlying the repair of plasticity damage. While GAP-43 expression is closely related to injury repair, the mechanism by which it changes in the OSAS rat model remains unknown. Based on these previous studies, a rat model was constructed using the CIH method to simulate OSAS. The Morris water maze was used to dynamically assess behavioural changes. Immunohistochemistry and immunoblotting were used to detect the expression of SYP and GAP-43 in the rat hippocampus before and after CIH to investigate the molecular biological mechanism of OSAS and cognitive dysfunction, and to provide a new experimental basis for clinical diagnosis and treatment. 3. changes in the pathophysiology, histology and pathology related to OSAS, such as blood oxygen saturation, oxygen partial pressure changes, and anatomic abnormalities of the airway are observable. 1.2 Morris water maze: After the OSAS rat model was successfully established, a behaviour test was conducted for each group of rats. The Morris water maze mainly consists of a place navigation test and a spatial probe test. On the day before the test, rats from all groups were placed in a pool and allowed to swim for 2 min to observe their swimming abilities and rats that could not swim were excluded from the study. The place navigation test was conducted by dividing the pool into four quadrants, placing the rats in the quadrant farthest from the platform, randomly selecting entry points in the four quadrants, and then placing the rats into the water. The time was recorded from rat entry until the rat found the platform, which was indicated as the incubation period. If a rat failed to find the platform in 2 min, it was guided to the platform and allowed to rest for 10-20 s. The place navigation test was conducted for 5 days, and the test was conducted at the same time each day. The spatial probe test was conducted one day after the place navigation test by removing the platform, but maintaining the other conditions. The rats were placed in the water in the centre of each quadrant (facing the wall) from the second quadrant in a clockwise manner.Then, rats were allowed to swim for 2 min, and the effective number of crossings of the original platform were recorded. After the test, we statistically analysed the obtained data. 1.3 Tissue preparation: For immunohistochemistry, 4% paraformaldehyde was used to fix hippocampal tissue. After the antibody was added and incubated for 24 hours, the tissue sections were analysed by optical microscopy. For Western blotting, the hippocampus was quickly removed from ice and frozen at -80℃ in liquid nitrogen for further use. 1.4 Western blotting (WB): Briefly, proteins were extracted according to the manufacturer's instructions (Jiangsu Kaiji, China). An SDS-PAGE gel (5% layer gel) was used for separation by gel electrophoresis with a 10% gel, and the total protein lysates (20 μL per lane) were separated by electrophoresis. Then, the separated lysates were transferred to a polyvinylidene fluoride (PVDF) membrane (BIO-RAD). The Polyvinylidene fluoride membrane was incubated with 5% BSA for approximately 2 hours at room temperature to prevent non-specific binding. Then, the membrane was incubated overnight with rabbit anti-SYP (1:15000, Abcam, Cambridge, MA, USA), rabbit anti-GAP-43 antibody (1:10000, Abcam, Cambridge, MA, USA), and mouse anti-beta-tubulin antibody (1:3000, ProteinTech, USA). Next, a horseradish-labelled goat anti-rabbit IgG (H+L) (1:5000, Beijing Zhongshanjinqiao Biotechnology Co., Ltd.) secondary antibody was incubated with the PVDF membrane. After incubation, TBST solution was used to wash the membrane in a shaker three times for 10 min per wash. Finally, the luminescent agent (A:B=1:1) was fully exposed to the PVDF film using a BIO-Chemi DocTM Touch Imagine System. 1.5 Immunohistochemistry: The reagents and equipment uesd for immunohistochemistry included rabbit anti-SYP antibody (Abcom), rabbit anti-GAP-43 antibody (Abcom), mouse anti-beta-tubulin antibody (ProteinTech), marker protein (ProteinTech), 0.01 MPBS dry powder (Beijing Soleboro Technology Co., Ltd.); horseradish peroxidase-labelled goat anti-rabbit IgG anti-GAP-43 secondary antibody (H + L) (Beijing Zhongshanjinqiao Biotechnology Co., Ltd.) , horseradish peroxidase-labelled goat anti-mouse IgG anti-GAP43 secondary antibody (H + L) (Beijing Zhongshanjinqiao Biotechnology Co., Ltd.), and an inverted microscope (Japan OLYMPUS). Experimental data are expressed as the mean ± standard deviation ( ±s). The data were statistically analysed using SPSS 18.0 statistical analysis software. A paired t-test was used to determine the average blood oxygen saturation of the rat tail artery. Repeated measures analysis of variance was performed on the Morris water maze data, and one-way analysis of variance was performed on the WB data from different groups at the different time points. P<0.05 indicates statistically significant differences. In this study, a closed hypoxic chamber was used to simulate an animal model with CIH that conformed to OSAS pathophysiological characteristics. In the process, the rats in the CIH group were observed to be dispirited, unresponsive, and subject to hypoxia symptoms and signs, such as waking up as a result of laboured breathing, lifting of the head to breathe, and deepened and quickened abdominal breathing. As shown by the detection of the blood oxygen saturation levels in the rat tail artery in the CIH group, the average blood oxygen saturation of the rat tail artery (mean Sp02, MSp02) of rats in the CIH group that were placed in the hypoxic chamber was 69.72±1.68%, and the fluctuation range of the overall SpO2 was 60-72%. When the rats were placed back in the air environment (reoxygenation interphase), the MSp02 was 96.38±1.61%, its overall fluctuation range was 93-100%, and the low amount of oxygen before and after MSp02 decreased by >4%, which was statistically significant (P<0.05). The rat model conformed to the pathophysiological characteristics of OSAS and was successfully established (Figure 1). A behaviour test was conducted for the rats in each group. In the positioning voyage test, compared with the normal group, the escape latency of rats in the CIH 1W group was prolonged; however, the difference was not significant (P>0.05). In the CIH 2W, CIH 3W and CIH 4W groups, the escape latency was prolonged, and the difference was significant (P<0.05). In the space exploration test, the number of platform crossings among the rats in the normal group was 5.03±1.51, whereas the platform crossing numbers in the CIH 1W, CIH 2W, CIH 3W, and CIH 4W groups were 4.95±1.05, 3.76±0.65, 2.58±0.34, and 1.89±0.28, respectively. 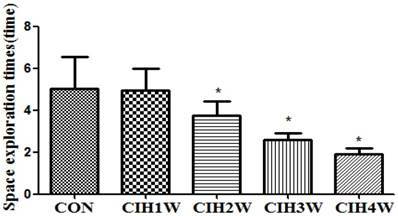 Compared with the normal group, the difference in the CIH 1W group was not significant (P>0.05), whereas those in the CIH 2W, CIH 3W, and CIH 4W groups were significant (P<0.05) (Figure 2 and Figure 3). The protein expression levels of SYP and the corresponding internal parameter (β-tubulin) in the hippocampal tissues of all groups were analysed via Western blotting, which showed that the expression of SYP and β-tubulin was detected in the hippocampal tissues of the rats in all groups. By analysing the IOD vales with IPP software, the IOD ratio of SYP and β-tubulin (SYP/β-tubulin) in the normal control group was determined to be 2.8532±0.0761. In the CIH 1W, CIH 2W, CIH 3W, and CIH 4W groups, the IOD ratios were 2.3253±0.0526, 1.8622±0.0516, 1.5386±0.0293, and 1.12015±0.0102, respectively, which were significantly different from that in the control group (Figure 4). The protein expression levels of GAP-43 and the corresponding internal parameter (β-tubulin) in the hippocampal tissues of all groups were analysed via Western blotting, which showed that the expression levels of GAP-43 and β-tubulin were detectable in the hippocampal tissues of the rats in all groups. By analysing the IOD values with IPP software, the IOD ratio of GAP-43 to β-tubulin (GAP-43/β-tubulin) in the normal control group was 2.0948±0.0450. The IOD ratios in the CIH 1W, CIH 2W, CIH 3W, CIH 4W groups were 2.5070±0.0254, 1.8161±0.0358, 1.6104±0.0337, and 1.3803±0.0398, respectively, which were significantly different from that in the normal group (P<0.05). 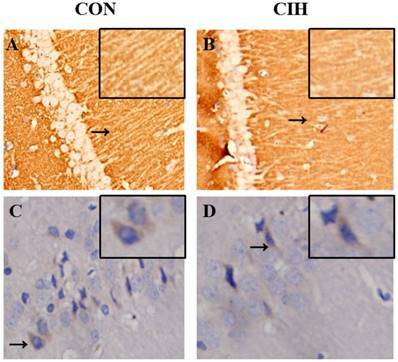 Orientations of SYP and GAP-43 expression in the hippocampal tissues of rats in the normal and CIH 4W groups were evaluated using immunohistochemistry analysis. SYP was expressed on the neurocyte membrane of hippocampal CA1 in rats in the two groups, and the expression was lower in the CIH 4W group than in the normal control group. 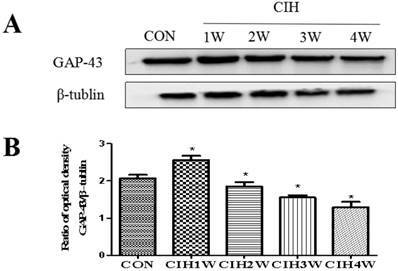 GAP-43 was expressed on the neurocyte membrane and in the cytoplasm of hippocampal CA1 in rats, the expression in the CIH 4W group was decreased compared with that in the normal control group (Figure 6). OSAS is characterized by a disturbance of the pharyngeal dilatation muscle. Its primary pathophysiological characteristic is CIH during sleep, and it is closely related to neurocognitive dysfunction, cardiovascular and cerebrovascular events, metabolic disorders and other diseases. It has been recognized as a very common public health problem . Currently, the apnoea-hypopnea index (AHI) and nocturnal oxygen saturation are the two most commonly used clinical indicators to measure the severity of OSAS . In recent years, with increasing global attention to OSAS, there have been an increasing number of basic studies on OSAS. Therefore, the successful establishment of animal models has become an important method of evaluating the pathophysiological mechanisms, clinical features, comorbidities, new treatment methods and other aspects of OSAS. However, until now, there has been no uniform standard for the establishment of animal models of OSAS either locally or abroad. Previously, the pathological features of OSAS have been simulated by altering the upper airway or by mechanically blocking the airway. However, due to invasive operations and difficulty in controlling the severity of airway obstruction, this modelling approach is complicated, time-consuming. The success rate is also extremely low . An improved CIH modelling method was first reported by Fletcher EC and colleagues in 1992 . This method is easy to regulate and can induce different degrees of OSAS, and it also mimics important OSAS-related symptoms, such as intermittent hypoxia, lethargy, arousal and anxiety. In addition, numerous studies have shown that CIH can induce changes in brain function and function of rodents in the brain, such as damage to synaptic plasticity, increased apoptosis in the hippocampus and cortical neurons, and nervous system oxidative stress. The basis of brain pathological processes, such as arterial blood flow reduction and neuroinflammation, are closely related to OSAS cognitive dysfunction. Therefore, CIH modelling methods are widely used by a wide variety of researchers to study of OSAS mechanisms . This model has been improved by Julian et al . where the OSAS model is established by CIH. This approach involves reducing the oxygen concentration in a closed chamber and placing experimental animals into the hypoxic chamber intermittently. Cyclic intermittent hypoxia is induced to mimic the pathological features of OSAS. In this study, rats were intermittently placed into the hypoxic chamber for 3 min per cycle, and intermittent hypoxia was induced for 8 hours every day for 4 weeks. Upon establishing the model, the MSp02 was detected in rat tails. Compared with the normal control group, the MSp02 of the rats in the CIH group decreased by>4%, and during the experiment, the rats were observed to have wakefulness, head-up breathing, and deepening of abdominal breathing. The OSAS criteria were satisfied after observing hypoxic symptoms and signs, an apnoea index of 20 times/h, a lowest MSp02 of<80%, and a good simulation of the pathophysiological characteristics of OSAS, which indicated successful modelling. The Morris water maze is widely used in neurocognitive foundational research. The test procedure mainly includes two components as follows: the positioning navigation test and the space exploration test . In this experiment, the Morris water maze was used to detect the spatial learning and memory ability of rats to determine whether OSAS rats had cognitive dysfunction, and to simulate OSAS cognitive impairment in the animal models. By conducting a 5-day experiment on each group of rats, in the navigation test, it was found that after three days of training, the escape latency of each group of rats was significantly shortened, but it became stable on the days 4 and 5. The experimental rats had improved learning ability and formed a stable understanding and cognition of the spatial environment of the water maze. Compared with the normal group, the experimental rats in the CIH 1W group had a shorter escape latency and crossed the platform fewer times, but there was no statistically significant difference, indicating that the time of hypoxia had not caused cognitive functional impairment and indicated that the rats were lacking in cognitive impairment. The oxygen tolerance was improved. From CIH 2W to CIH 4W, the escape latency of rats gradually increased, and the number of platforms crossings was significantly less than that of the normal control group, indicating that the memory extraction and spatial association abilities of rats exposed to a CIH environment were impaired. Cognitive function is mainly manifested in attention, memory, learning ability and executive function, and plays an important role in the daily life of humans. In patients with moderate to severe OSAS, cognitive dysfunction leads to decreased work efficiency and memory loss, which seriously affects their daily life. The hippocampus is an important part of the central nervous system and plays a vital role in cognitive functions such as learning and memory, one of the most sensitive areas to hypoxia . The synaptic plasticity of the hippocampus is the neural basis of learning and memory, and synaptic plasticity changes in the hippocampus are directly related to cognitive function. Synapse are important structures for the transmission of information between neurons and the formation and remodelling of neural circuits. Whether neuronal information can be transmitted, processed and stored smoothly depends on the integrity of synaptic structure and function. Synaptophysin (SYP) is a specific protein on the synaptic vesicle membrane. It consists of 307 amino acids, including four transmembrane regions. Both the amino terminus and the carboxy terminus are exposed to the cytoplasm, and the hydroxyl terminus can be combined with Ca2+, one of the synaptic vesicle calcium-binding proteins, phosphorylated by tyrosine kinase and passed through with N-methyl-D-aspartate receptor (NMDAR) and α-amino-3-hydroxyl. The 5-methyl-4 isoxazole receptor (AMPAR) combines to form a signalling complex involved in synaptic signalling and induces the formation of long-term potentiation in the hippocampus . In hippocampal neurons, SYP binds to the NMDAR subtype and anchors it to specific parts of the presynaptic membrane, which increases stability and thus affects synaptic plasticity. In addition, SYP binds to related proteins in the NMDA receptor signalling pathway and plays an important role in the regulation of synaptic states and the maintenance of synaptic structures. Studies have confirmed that SYP is closely related to the formation of synaptic plasticity in the hippocampus and is an important molecular marker associated with synaptic plasticity. CIH is an important pathophysiological feature of OSAS. Most studies suggest that OSAS leads to cognitive dysfunction and CIH leads to hippocampal structural and functional damage, especially synaptic damage in this area . SYP is rich in dendritic spines, and its density and distribution can indirectly reflect the number and distribution of synapses in the body, which is closely related to cognitive function. In the early stage of neuronal development, SYP is mainly distributed in the nucleus of neurons. As the nerves mature, SYP eventually moves to the protrusions to form a point-like distribution pattern, suggesting that SYP is closely related to the formation and maturation of synapses. While CIH can cause hippocampal neuron death leading to denervation of axons, at this stage, hippocampal vertebral cells can prolong the spinous processes and reach new synapses at the terminals of adjacent spinous processes, while SYP is a stable extension of spinous processes. Essential synaptic proteins make hippocampal synaptic reconstruction more effective. Additionally, SYP can regulate synaptic plasticity by affecting the synaptic structure and neurotransmitter release. SYP is involved in the release of Ca2+-dependent neurotransmitters and the transport of vesicles, whose expression levels indirectly reflect the integrity and functional status of synaptic structures. The increase in SYP indicates an increase in synaptic number, synaptic transmission function, and synaptic plasticity. Therefore, damage and the number of synaptic functions are positively correlated with the degree of cognitive impairment. A previous study has shown that hypoxia can promote the activation of neuroglia and then produce excessive amounts of cellular inflammatory factors, free radicals, nitrogen oxides, mitochondrial dysfunction, etc., causing synaptic function and structural damage . In transgenic mice with Alzheimer's disease, the loss of long-term SYP can aggravate the memory function of the mice, and an improvement in cognitive function is accompanied by an increase in the expression of SYP in the hippocampus. In this study, immunohistochemistry was used. 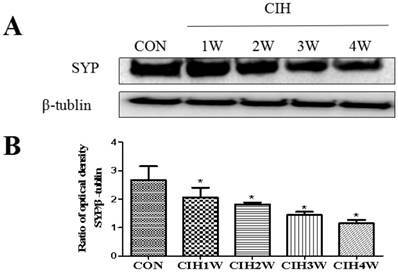 It was found that SYP was highly expressed in the hippocampus of normal rats but was low in the hippocampus of the CIH 4W group and was mainly localized on the membrane, indicating that chronic intermittent hypoxia leads to a decrease in SYP expression. The expression of SYP in the hippocampus at different timepoints after CIH was induced in rats was detected by Western blotting. It was found that SYP expression decreased with increasing CIH time, and the cognitive function of experimental rats also decreased, indicating a certain correlation between the two. 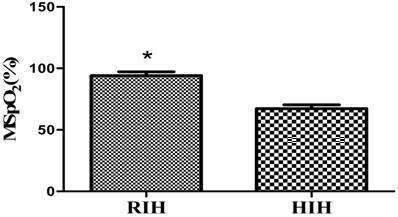 CIH caused a decrease in the expression of SYP in the rat hippocampus. Combined with the behavioural results of experimental rats, it was suggested that the decrease in SYP expression may be one of the causes of cognitive dysfunction in OSAS rats. GAP-43 is a neural tissue-specific phosphoprotein closely related to neurodevelopment and synaptic remodelling. It is abundantly expressed in the hippocampus of the nervous system, suggesting that it is associated with long-term learning and memory. When the nervous system is damaged, the neurons around the injury site are compensated by lateral branch germination and reactive axonal regeneration. The GAP-43 expresssion level in these areas increases with increasing damage repair time, and then gradually decreases. Therefore, the expression level of GAP-43 is considered to be the preferred probe for studying neural plasticity such as nerve regeneration and repair . As previously mentioned, in the early post-injury of the nervous system, the increased expression of GAP-43 is a protective compensatory response of the body to the injury and has an intrinsic protective effect on the body. This concept has also been shown in other acute and chronic injury experiments in the hippocampus. Currently, the regulation of GAP-43 expression is theoretically conducive to the establishment of synaptic connections, and can improve the brain function of rats to some extent, and compensate for brain damage caused by CIH. In this study, an immunohistochemical method showed that GAP-43 was highly expressed in the cytoplasm and membrane of the hippocampus of normal rats but exhibited low expression in the hippocampus of the CIH 4W group, indicating that hypoxia caused decreased GAP-43 expression that was determined by Western blotting. The expression of GAP-43 in the hippocampus increased at different timepoints after CIH induction in the experimental rats. Compared with the normal control group, the expression of GAP-43 increased in CIH 1W, and then gradually decreased, indicating that CIH can cause the expression of GAP-43 in the hippocampus of rats to change and the increase in CIH 1W group is related to the events involved in hypoxia, including mossy fibre sprouting and synaptic remodelling, until the establishment of complete synaptic connections, where the GAP-43 expression level suddenly decreased, consistent with the results of Kawasaki T and others. The body or cells produce a series of adaptive responses in the early stage of hypoxia to maintain oxygen homeostasis, especially chronic intermittent hypoxia, which mainly affects gene expression and increases protein expression in the early stage. In addition, the characteristic CIH process of OSAS is similar to ischaemia-reperfusion, repeated hypoxia and reoxygenation, producing excessive oxygen free radicals, destroying the balance between the oxidation system and the antioxidant system, and causing oxidative stress. The body produces oxidative damage, such as cell membrane lipid peroxidation and denaturation of intracellular proteins, ultimately leading to cell death, tissue damage, and decreased expression of various intracellular proteins. Oxidative stress also induces apoptosis by activating the mitogen-activated protein kinase pathway, nuclear factor κB pathway, and p53 pathway . The brain has the highest oxygen consumption in the body, contains a large amount of polyunsaturated fatty acids, and is more susceptible to oxygen free radical attack than other tissues, and neurons can only supply energy by consuming glucose through aerobic metabolism: therefore for high concentrations of ROS, the brain is very sensitive to damage. Combining these data with the behavioural results of experimental rats, we concluded that CIH 1W rats did not have significant cognitive impairment, whereas CIH 2W, CIH 3W and CIH 4W rats exhibited cognitive impairment. Therefore, GAP-43 expression is a crucial factor in OSAS. Decreased GAP-43 expression in rat hippocampal tissue may be one of the causes of cognitive decline. However, subsequent experiments are required for further investigation of specific associated mechanisms. This research was supported by the National Natural Science Foundation of China (81660194).The present study was also supported by the Key Laboratory of Basic Pharmacology of Ministry of Education, Zunyi Medical University, Zunyi, Guizhou, China, 563003. We thank all partners and staff who helped us in the process of this study.